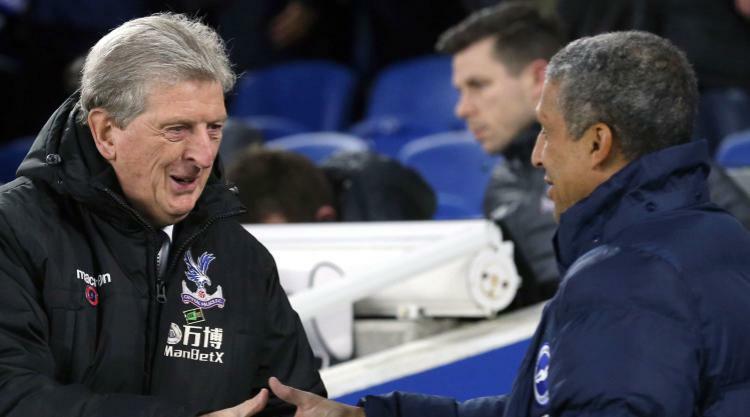 Roy Hodgson has called for more from his misfiring forwards as struggling Crystal Palace continue their search for a first away goal since April. Palace picked up their first Premier League point on the road this season following Tuesday's 0-0 draw at bitter rivals Brighton, but they remain without a goal away from Selhurst Park since beating Liverpool at Anfield more than seven months ago. Hodgson has masterminded a mini-revival after replacing Frank de Boer as Eagles manager in September, taking nine points from the last seven games following seven successive defeats. However, the 70-year-old thinks his bottom-of-the-table side is capable of producing a greater attacking threat. "With the firepower that we think we have in our team, with the quality we have in that front portion of our team, I think we could have done more," said the former England boss following the lacklustre stalemate on the south coast. "I think the players will agree with me, they could have done more, because the opportunities were there. "We got ourselves into the positions, but we didn't capitalise on them. "I think that we've got more in our locker." A big positive for Palace from the midweek game was the return of record-signing Christian Benteke, who made his first start since suffering a knee injury in September. The Belgium striker had one of the clearer opportunities against the Seagulls, but home goalkeeper Mat Ryan produced fine saves to deny him and Wilfried Zaha's follow-up attempt. Former Eagles striker Glenn Murray almost won it for the hosts late on when his header was blocked on the line by Andros Townsend and manager Hodgson feels the intense rivalry between the two clubs may have contributed to the lack of entertainment. "The expectations from both sets of fans was very, very high, the players feel under pressure," he added. "Of course when you get that kind of pressure, the chances that you will take risks or throw caution to the wind they diminish because you are so frightened that you're going to be the one that's cost your team a valuable point by making a silly mistake." Chris Hughton believes Brighton's home form is suffering due to the quality of top-flight opposition. Although they remain unbeaten at the Amex Stadium since the 2-0 opening-day defeat to leaders Manchester City, mid-table Albion, who won 17 of their 23 Championship home games en route to promotion last season, have drawn four matches in succession in front of their own fans. "We're playing against better teams and it's not a bad place to come and play the Amex. "Probably what we could get away with over the last couple of years in the Championship is harder to do in this division."